. .DISARMAMENT & SECURITY. . The Saudi regime is one of the most brutal and authoritarian anywhere in the world. Its ruler Mohammed Bin Salman is implicated in the murder of journalist Jamal Khashoggi in Turkey and has rounded up and tortured opponents at home. His government is also the main protagonist of the terrible war on Yemen. The Saudi led war has already devastated Yemen and killed tens of thousands of people. Aid agencies warn that if it continues it will cause the worst humanitarian catastrophe since World War Two. Yet the British government continues to back the regime. Earlier this year Theresa May welcomed Bin Salman to Britain, claiming he was a reformer. 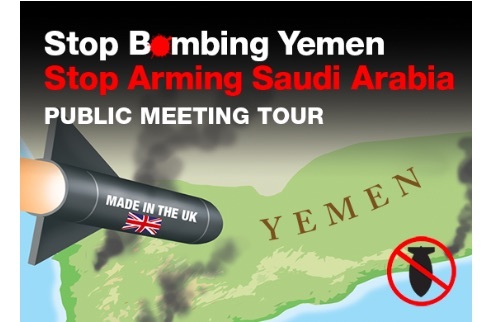 Really the British government stays close to Saudi Arabia because Saudi buys more arms from Britain than any other country, because it is a major oil supplier to the West and because it has long been a key ally in a region the West is desperate to control. How can we be sure to get news about peace demonstrations?